Potty training is one of the most important, and one of the most dreaded tasks of bringing a new puppy home – but it has to be done. If you don’t get potty training – or house training – done the right way, you and your pup will both be frustrated and fed up. Potty training a new dog takes a lot of patience and planning, but to help you get started on the right foot (or paw), here are our top tips! Dogs like to keep their personal area clean, so they will often venture away from their own territory to use the bathroom. The best way to do this is to use a crate to teach your dog that he has to wait to “go” outside. 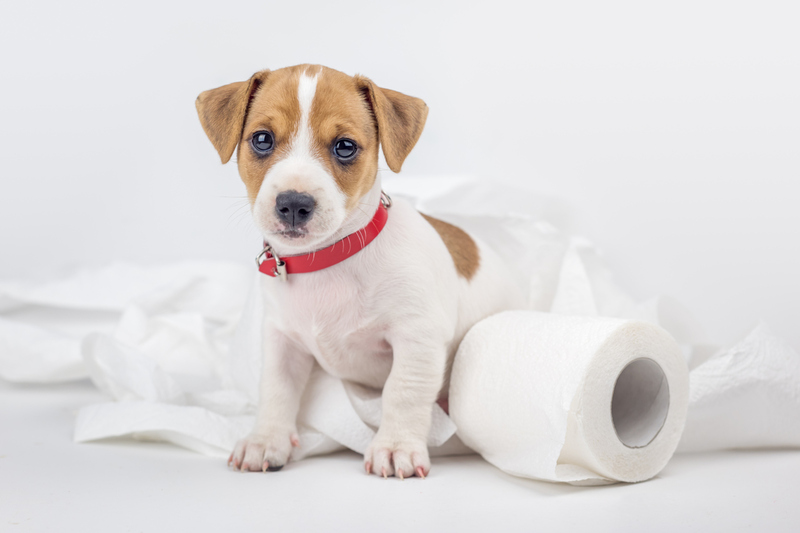 Timing is everything when it comes to potty training your pup. It’s important to remember that your puppy is small, which means his or her bladder is even smaller and needs to go about every 2-3 hours – so patience is key here. Accidents are bound to happen with a new pup, and it’s second nature for us to want to discipline and punish them for “going” inside – but don’t do that! Punishing your puppy for having an accident in the house will only teach the dog to fear going to the bathroom when you are around. And he will likely still go in the house, just not when you are looking. Have you ever heard the saying, “A quiet puppy is trouble”? Whether your pup is getting into the trash, chewing up your work bag, or peeing on the rug – a quiet puppy usually means trouble. Preventing accidents requires you to pay attention to your pup at all times, and being able to catch them before they have an accident is a great training method. Every time your pup “goes” outside, praise him or her like there’s no tomorrow. Give him or her a treat (we always recommend our All Natural Beef Market Liver), a belly rub, pat on the head, and a good old, “Good dog!” to celebrate his or her decision to go outside. This will help motivate your pup to want to go outside instead of in the house. Still Having Problems With Potty Training? If you have tried all these tips for a few weeks and are still having issues, there could be a physical or emotional reason. Your dog may be anxious, scared, or could have a health issue like a urinary tract infection. In this case, it would be wise to consult your veterinarian who can better identify and treat these problems. And, if you need more advice or puppy food and supplies, give us a call or come visit us in Toronto!